Caution: This plugin is still unstable. 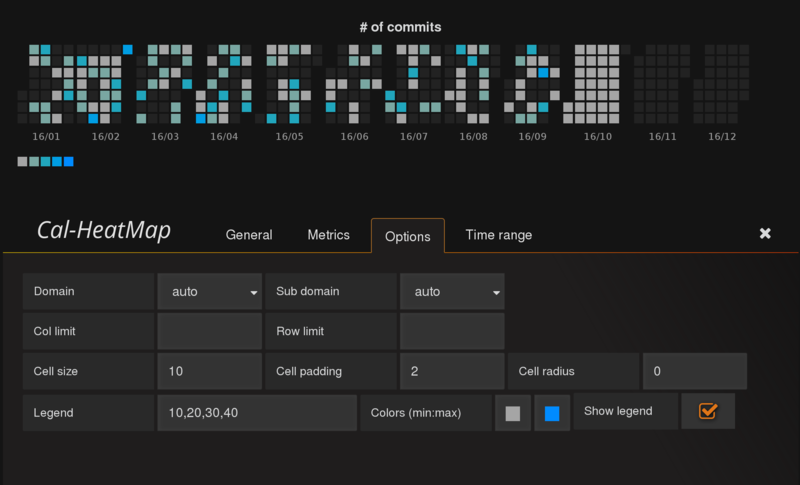 This plugin provides calendar with heatmap, like GitHub contribution calendar. To visualize numerical series data like temperature recorded each minutes, you may need to specify domain and interval appropriately. For example, to plot the data for each hour (y-axis) and for each day (x-axis), you need to choose "day" as the domain in Option tab, and group metrics by 1 hour interval. Otherwise, the temprature in the same group might be summed up. Colors, domains, subdomains, cell sizes etc. can be configured. Please check the official reference for Cal-heatmap for details. cal-heatmap.js in this repositry is modified from original source so that it can be loaded using "import" clause (code for AMD loader was removed).